Part of the team met early Saturday morning at the Wesley Foundation to pack the van and head out to Atlanta. Wilson, Melvin, Rachel, and MaeLee all met us at the airport since they drove separately.Â The trip to the airport was full of excitement and anticipation as we prepared ourselves for our 5:30 pm flight.Â It was also full of a few napping team members.Â Scott mentioned that he was eager to witness the change in direction of the water. We passed through the normal checkpoints with only one hold-up:Â Ketiaâ€™s bobby pins.Â We attempted to document this special occasion, but were warned by security that this was not allowed.Â The five-hour flight lasted what seemed to be well into the night.Â However, we arrived in Quito, Ecuador around 10:30 pm.Â Sleepy passengers waited in line to go through the South American customs to be joyfully greeted by Dr. Roberto and Nanny. After arriving at the Hotel Tambo Real, we were given a few instructions, room keys and permission to take our exhausted bodies to bed. Sunday morning, we met for a devotion given by Ketia from a few chapters of 1 Corinthians.Â Her message relayed the importance of unity in being the body of Christ and serving in love.Â Breakfast was delicious (as have all the meals been at the hotel).Â Our next order of business was the bus ride to the Middle of the World.Â We were able to spend some time on the tour learning about early tribes native to Ecuador.Â We were also able to witness the water flowing in three directions:Â straight down, clockwise and counter clockwise. 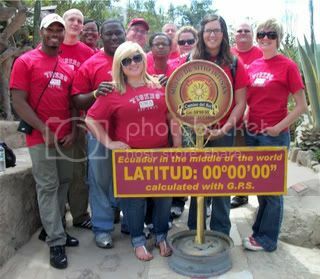 A few team members were able to balance the egg, in addition to walking the equator without stumbling.Â The next stop we were allowed to visit the spot that was thought to be the original middle of the world, yet it was not so due to miscalculations many years ago.Â The bus rides throughout Ecuador have allowed us to view much that we have not before. On our last stop of the afternoon, we went to church at Mama Yoliâ€™s and were blessed by the welcome we received.Â What joy it is to see so many worship the Lord and in so many ways! Rachel and MaeLee joined some of the women in praise by dancing.Â Ashley shared a bit of her testimony.Â Wilson translated the message given today. After dinner, we met as a team with SIFAT to talk about what our plans for the week are (mostly in construction) and were introduced to Anita.Â Anita explained her vision (along w/ her husbandâ€™s) for the future of the children.Â Then we had our evening devotional given by Scott.Â As team members, we were asked to share two things:Â 1) How did you experience Godâ€™s love and grace?Â 2) How did you reach out to God?Â Several team members responded.Â Ashley experienced God while giving her testimony today in church.Â She also mentioned Peterâ€™s doubting and the relief she felt with Godâ€™s spirit within.Â Richard mentioned the welcoming presence of the children in addition enjoying the ladies dancing.Â Ketia posed the question in response to Richardâ€™s joy of the children, â€œWhat hinders us in our culture causing us to be so stand-offish?â€Â MaeLee saw God in the scenery, the beauty of the mountains and knowing that no one else could have ever created such.Â Dan saw God in the completion of Mama Yoliâ€™s, seeing what has been built.Â Dan stated, â€œWe are here to show Godâ€™s love in tangible ways, and there it was.Â We have a great fear of strangers, but often times in the Bible, God shows up as the stranger.Â Here we are as strangers in a country, yet Nanny showed us unconditional love.â€Â Scott was the last to comment, citing the UMWâ€™s calendar as the source of his Scripture passage used in this eveningâ€™s devotion.Â He felt the church and children welcomed us whole-heartedly and he was grateful for it. Overall, the experiences weâ€™ve had thus far have blessed us immensely.Â Only one full day has passed, and yet we feel as if weâ€™ve been here so much longer.Â We look forward to serving the Lord this week and loving those around us. To view our photos from Saturday and Sunday, click here and here. One more here!